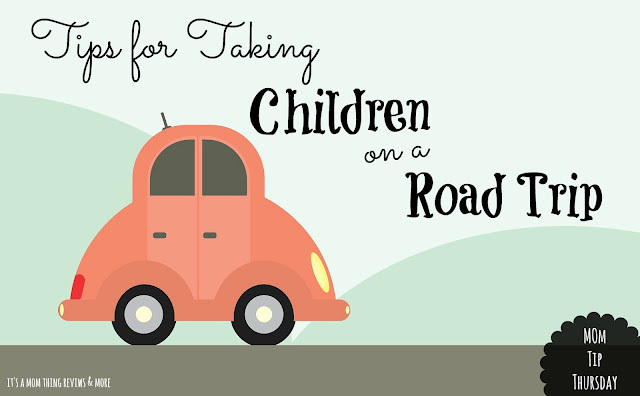 With summer in full swing there are many families gearing up to take road trips! We are preparing for a road trip as well! I wanted to take some time to share a list of tips that I think are most important to consider for family road trips! These tips make traveling with children a little bit easier and to make you feel a little bit more prepared! Do a safety check and plan for emergencies: Before you hit the road for a long trip check all of your children's car seats to make sure that they are properly secured. Also be sure you have things like jumper cables and a flashlight. Double check that you have your car charger as well so that you can be in touch with someone in case of an emergency. Pack a bag with necessities to keep in the car. Include a change of clothes for each child in case of an emergency, a roll of paper towels, a pack of wipes, and even a garbage bag. You may want to include a small first aid kit, pain reliever, and allergy medicine. Plan for hotel stays on the way: If you are stopping at a hotel along the way to your destination you may want to put clothes for the next day, toothbrushes, toothpaste, and anything else you will only need for that night in your emergency bag in the car so that you do not need to bring everything into the hotel for only one night. Have children fill a backpack: Needless to say when traveling with kids one of the most important things is keeping them busy! Have each child that you are travelling with fill a backpack with things to keep them busy. Include things like coloring books and paper, crayons, books, travel games, figures, and more. Many people recommend printing out coloring sheets, BINGO cards, and activities (such as word searches). Make sure that their backpacks have enough fun items for them but are also light enough for them to carry on their own. You may also want to have them bring a pillow and blanket (or even their favorite stuffed animal) to get comfy in the car. Bring along gadgets: Gadgets such as smartphones, tablets, portable DVD players, and travel gaming systems are amazing to have during road trips. If you are bringing along a tablet download some new apps before you leave to give your children new activities to keep them busy. You could also purchase a new DVD to watch or a new game for their game system. Before you leave the house be sure to charge any gadgets you are bringing and put the chargers in your child's backpack; also bring along car chargers. Play road trip games: We have a game that we often play in the car called "The flag game". While we are in the car we search for flags. Games such as this can help keep your children busy during long periods of time in the car. Other games like this are The Alphabet Game where your look for each letter in order and the License Plate Game where you search for a license plate from each state. Bring snacks and drinks: Since you can't stop during a road trip every time your child wants a snack or a drink it is really important to bring some along for the trip. Not only will bringing snacks along make it so that you don't have to stop as often, but it will also save you money since rest stops or stores along popular travel routes tend to raise prices. Include a mix of healthy snacks and treats to give children some variety. Also pack water bottles and juice boxes (bring along no-spill cups for little ones). Be sure to limit juice and water intake for children though so that you don't need to have tons of potty breaks! Schedule stops at specific intervals: Since expecting young children to sit still for a long time is unrealistic plan some stops along the way at specific intervals. Allow kids to walk around and stretch their legs a bit. Look up rest areas, bathrooms, restaurants, and even playgrounds along the way so that you have places in mind to take breaks. when you take your next road trip!